Steampunk is situated in an interesting place for radicals: it can, as the Catastrophone Orchestra put it, offer a “non-Luddite critique of technology,” and sites like Beyond Victoriana use steampunk as a platform to combat racism and orientalism. This, plus its ability to explore colonialism, class, and gender while looking oh-so-very-cool in the process has attracted more than a few radical authors to the genre, from those that are explicitly anarchist like Alan Moore to socialists of various stripes like China Miéville. The genre has also seen a large recent growth in popularity, its aesthetic making appearances in mainstream television shows like Castle and that terribly embarrassing Bieber Christmas music video. One of the most well known steampunk novels, Cherie Priest’s Boneshaker, is currently being adapted for a major motion picture. Bill Willingham’s comic Legenderry is one of the latest takes on the genre. Willingham is probably best known as the writer for the Eisner Award winning Fables, an excellent comic series, released nine years before the airing of Once Upon a Time, that imagined our childhood fairy tales stuck in exile in our modern world. So I was excited when I stepped into my local comic shop and bought the first issue of Legenderry. I had faith that Willingham could do the genre justice. The comic itself is set within the fictional city of Legenderry, and from the very beginning of the story we’re met with poor writing. There’s an airship floating above the town, as a radio announcer narrates the story. The next panels take us to an upscale club, filled with well-to-do members of society discussing the most important issues of the day. Pseudo-victorianese is mashed with contemporary English and forced down your throat by a boring upper class white man who elaborates the proper way to make a martini. It doesn’t get any better from there. A woman in distress barges in, and an improbable fight scene takes place, with the female owner of the club quickly throwing off most of her clothes before gruesomely taking out an army of Bane look-a-likes. The rather boring superhero theatrics alone would be probably have been enough for me to pass on the book, but it’s important to recognize just exactly how much Willingham’s neo-victorian book misses the mark on point after point. It’s not just the poor writing. Willingham gives us victoriana filled with all the expected characters: a city full of well-to-do white people, scantily clad women, a veneer of bronze and copper, unnecessary googles, and words that maybe kinda sorta sound like they are olde-timey. Willingham took the easy route, starting with a comfortable white, male world and throwing a facade of “victoriana” over the whole thing. While the existence of a powerful woman in the first issue is certainly not unwelcome, her purpose so far seems to be only to pass on the damsel in distress to a well-known male superhero duo in the second issue. How is it that writers can create fantastical worlds, with only the slightest connection to reality, and yet so rarely offer us worlds that break free from the violence of our own? The answer to that, of course, lies in who it is who writing these books, but that certainly can’t be all there is to it. Speculative fiction gives us a chance to, y’know, speculate, imagine, build worlds that don’t exist and explore the possibilities they offer. It gives us a chance to exist within the tension between that world and ours, a place in which we can improvise, test, and attempt to begin to see other relationships to each other and the world we inhabit. I waited to write this review until the second issue came out, hoping that all my problems with the comic could be chalked up to a slow start. 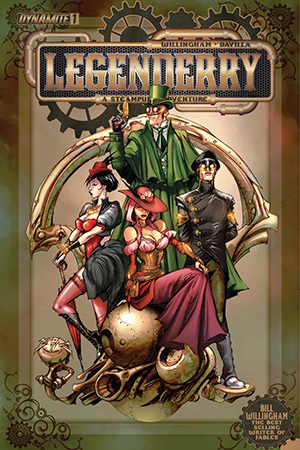 I hoped that the second issue would expand the world and give us something that might, in some small way, give us a glimpse of those aspects of steampunk which are of interest to those of us with a radical lens. Unfortunately this wasn’t the case. Legenderry is a great example of the least interesting parts of steampunk—corsets, goggles, and psuedo-victorian language—hot-glued to all the problematic aspects of both Victorian England and the present day. Far from allowing the steampunk aesthetic and obsession with contraptions to play a counterpoint to the lifeless modern designs of technology as a way to offer suggestions for other ways to relate to objects, Willingham uses steampunk as a facade placed over a superhero story we’ve all read before. His creation of a world without a single character of color, especially within a victorian setting, continues the problematic trend of whitewashing victorian Europe and hiding the realty of colonial violence that was a foundation of victorian society. It hides the colonial violence that continues to benefit those of us in the global north who have the privilege to write, read, and take part in re-imaging the past. We shall end this review much as we began, with the Catastrophone Orchestra’s excellent manifesto. Pingback: legenderry #1 by bill willingham | We are book punks.We are book punks.